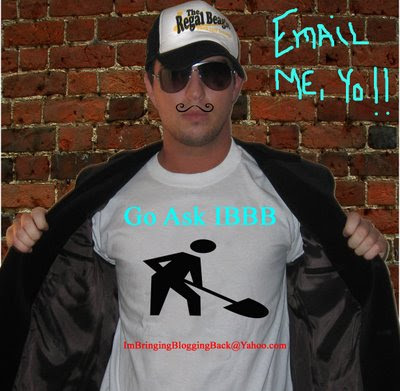 Back by popular demand is my own advice column: “Spencer’s Busy, Let IBBB Take a Message” In case you need to be caught up on what this is click here to read last weeks. Anyway, thank to all of you sick bastards who wrote in a question and sorry to those of you who I didn’t choose. Keep sending them and I’ll keep printing them out and shredding them! Here we go…. I’m dying to know, what’s your take on Kathy Lee Gifford on The Today Show?? You may have signed your email “anonymous” but you emailed me…therefore I know your name. Nice try, sneaky. You know, this gets me pretty upset. Why would anyone care what my take is on Kathy Lee Gifford? There is a war that’s still going on and we, as a universe, are facing day in and day out major issues with global warming, etc. Why not get your priorities in order!? PSYCH! Just playing. I could care less about global warming or the war. I am, however, passionate about all things Kathy Lee Gifford, or Snatchy Leak Gifford as I like to call her. Personally, I’ve only seen her once on The Today Show, but feel I can place 100% judgement on her based on the 25 minutes that I watched. Bottom line, she’s still doing that weird winking thing with her left eye. And I’m still confused by the relationship with her husband. Plus, Cody and Cassidy are complete douche bags. Therefore, I give Snatchy Leak Gifford 2 middle fingers up! Keep up the good work, Snatchy. I don’t mean to be mean, but you’ve been saying your goal is to host The Soup for 2 years now. No offense, but I don’t think The Soup has ever had a guest host. Sorry to burst your bubble. First off, thanks for addressing me by my full name. Second, thanks for crushing my dream. But, please don’t stop here. I’m sure there’s an orphanage that you want to swing by and fill the little kiddies in on that whole Santa thing. After that please get your passport ready because you have to catch your flight to give inspirational speeches to the summer Olympians. Be sure to let them know that most of them won’t win. They like that. Finally, swing on by a Jenny Craig meeting and just yell into the room “pointless.” They’ll all be squealing with delight. Anyway, thanks for the email.